There are a lot of doozies in the world of strange but true crimes and this one recently caught our eye. 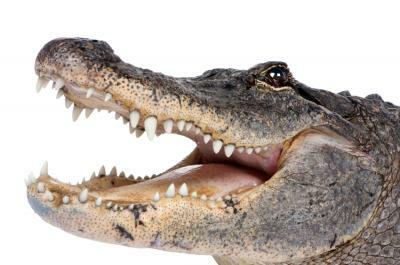 It's the case of a Florida man facing assault charges after Fish and Wildlife officials said he tossed a 3.5-foot live alligator into the drive-thru window of a Wendy's. He claims it was only a joke, but local officials aren't taking it so lightly. A judge has reportedly ordered him to stay out of all Wendy's restaurants, keep away from animals other than his mom's dog, undergo a mental health evaluation and remain weapons-free. Of course, none of this is unexpected given the nature of the alleged crime. Banks always have to be prepared to expect the unexpected or risk getting bitten--particularly when it comes to cybercrime. According to the Identity Theft Resource Center (ITRC), there have been 5,754 data breaches between Nov 2005 and Nov 2015, exposing some 856mm records. Further, IBM research estimates that the average breach costs $3.8mm. As you build protections against cybercrime, you have to be careful not to derail your own efforts. Some banks, for instance, may believe that encrypting data is enough to keep hackers out. While it's true that strong encryption is a critical defense mechanism, it's not a panacea. After all, even good algorithms can be susceptible if thieves are persistent enough. Look no further than the Logjam vulnerability uncovered last year. It allowed attackers to intercept and decrypt secured communications between users and thousands of websites and mail services worldwide. There's no doubt that banks need strong encryption, but beyond that, it is critical to utilize sophisticated tools such as advanced detection analytics to help identify emerging threats in real time. Another area bankers should stay on top of is making sure to have an effective patch management program. Just doing this can significantly decrease the number of security breaches because hackers buy old tools on the Web and repurpose them frequently. They also try to tunnel into weaker systems, so having the latest updates communicates a simple "go somewhere else" message to them. An effective patch management program should include written policies and procedures to identify, prioritize, test and apply patches in a timely manner, the FDIC notes. Such a program should also utilize vulnerability information culled from threat intelligence sources. Bank boards and senior management need to be held accountable for requiring regular reports on the status of the patch management program and for creating strategies to deal with systems or products that are at end-of-life or close to it. Next, given more employees are using their own devices for work purposes, banks are asking for trouble if they don't make extra efforts to encourage staff to regularly update their personal computing systems. Just recently, Oracle warned Java home users to beware of a flaw that attackers could exploit in older versions of the application. Oracle urged users to delete any previous installations and replace them with patched versions. Banks have ample resources to help boost proper defenses. The FDIC, for example, has developed Cyber Challenge exercises, which are a series of videos and simulations that are available free on its website. The FDIC also has a cybersecurity awareness training program, so send your teams and get the training. In addition, the FFIEC has its new cybersecurity assessment tool, which helps banks assess their risk and better determine cybersecurity preparedness. Cybercriminals will continue to bare their teeth and try to attack, so be careful when swimming on the Internet. It's up to banks to make sure to have the proper defenses that make thieves feel as unwelcome as finding an alligator in your lunch box. Treasury yields rose 4bp after the release of positive jobs data at the close of last week. In a CNBC interview, the CEO of JPMorgan says he does not see rates going negative in the US and that there are many encouraging signs in the economy. Research by Harvard Business Review finds employees spend about 41% of their time on activities that offer little personal satisfaction or could be performed competently by someone else. People reportedly do this to hold onto tasks that make them busy, or to feel important--weird. Research by Equilar on women in executive and board positions finds: only 14% of women that are C-level corporate officers at 5,000 US public companies sit on corporate boards vs. 17% of men. Research by Citibank finds workers spend 200 hours per year on their daily commute for a cost of about $2,600 annually. The average commute is 45 minutes. Meanwhile, 77% of people drive to work in their car vs. 21% who take a bus and 9% who use a subway system. A survey of Millennials by State Street finds 54% say the financial crisis is something that they take into account when making financial and investment decision. Research by Wasp Barcode Technologies of small businesses finds: 46% do not work with an accountant and 25% said they had lost track of whether a customer had actually paid them. A survey of 300 directors by Deloitte finds those who experienced a crisis said the areas of the business that were most affected included: company reputation and employee morale (48%), sales (41%), productivity (39%), leadership reputation (33%), and share price or regulatory or legal action (28%). The latest survey of small business owners by Wells Fargo/Gallup finds the most important challenge is: attracting customers and finding new business (14%); the economy (11%), hiring and retaining quality staff (11%), and government regulations (9%).